MJÖBERG, Anette and CLAESSON, Lo (2018) New ways to attract. Paper presented at: IFLA WLIC 2018 – Kuala Lumpur, Malaysia – Transform Libraries, Transform Societies in Session 153 - Poster Session. 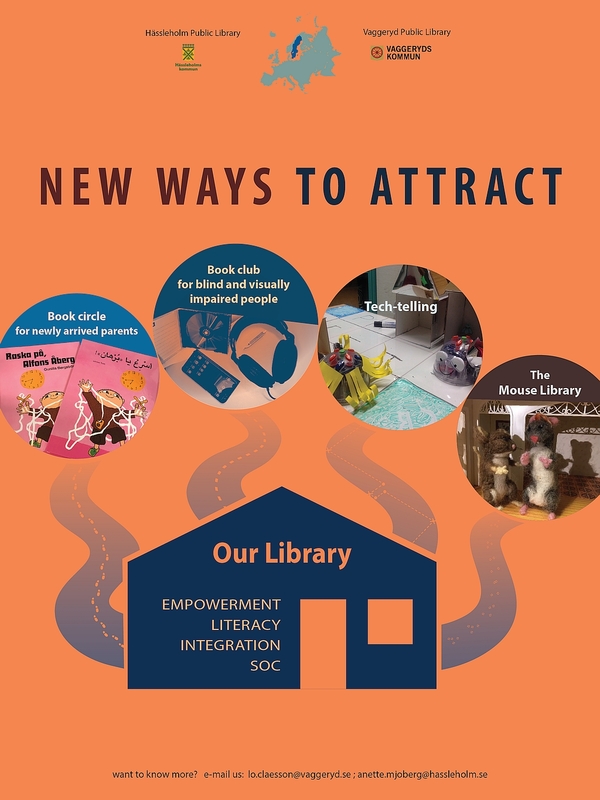 We would like to present four ways of attracting different groups of people to come to our libraries in Hässholm and Vaggeryd. We chose four project to present in the poster. Enjoy reading-a book circle for newly arrived parents: We used children´s literature to see if it was useful in helping newly arrived people to learn Swedish together with their children. A group of Arabic-speaking parents participated. We read Swedish children's books in both Swedish and Arabic. The parents read them home with their children and then we discussed the books again.. The participants enjoyed it so now we have started a new group. Book club for blind and visually impaired people: The association for blind people contacted our library. They were interested in starting a book club for their members. They asked if we could guide a group of six or seven people, gathering in the library to read and discuss books. So we started this book club three years ago and it members really likes it. Tech-telling: The library maker-space uses also for reading promotion, called tech-telling.We have small simple robots called "Bluebots".Together with the children we explore programming combined with film as a narrative tool. Kids can, for example, built a city based on tiles, the sides of which correspond to one step for the robot. The Mouse Library: There were mice in the library, so why not let them have their own? The librarians found an empty dollhouse, which we together with the children,rebuilding and refurbishing into a library for the felt versions of the mice. 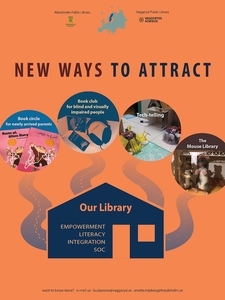 The library also set up a Mouse Library Instagram-account. The library hope to create many stories for the mice.